You'll hear from time to time about layoffs that are occurring in the trucking industry. But if you follow the news closely and you understand the industry, you'll find that these layoffs will have little to no affect on new drivers that are entering the industry. In fact, in some ways the economic downturn will actually help people who are now coming out of school and are new to the industry. How can this be? There are several things to consider. First of all, most of the layoffs that involve the trucking industry are not driver layoffs. Many of them are office personnel, mechanics, and management. These layoffs are also coming from companies that are in the trucking industry, like the engine builders and truck builders, but these are factory workers that are being laid off, not drivers. These count as "trucking industry layoffs" and make for good headlines, but for the most part do not affect drivers. Oftentimes the companies that are laying off drivers are doing so because two companies have merged into one, and there becomes an overabundance of drivers in a certain region. These types of layoffs occur most often in the LTL companies like CCX, Yellow-Roadway, and Conway. These companies have terminals throughout the U.S. and when two companies merge, there tends to be an overlap of terminals in certain areas. Some of the drivers at the affected terminals will be given the option of transferring to another terminal , while some may be laid off. Drivers that are coming out of CDL schooling and are new to the industry almost never go to work for one of these companies in their first year of driving, so these types of layoffs will not affect new drivers. Another circumstance where drivers may be laid off is in trucking fleets that are owned by private companies, like factories. 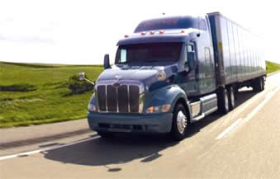 If a company owns their own trucking fleet and sales drop, the company oftentimes will not branch out and begin hauling freight for other companies. They only haul their own freight. So if business slows, there is less freight to be hauled, and drivers will either get a smaller number of runs per week, or in times of real hardship for the company, will be laid off. Working for a large, independently-owned trucking company that can haul freight for anyone they like is one way to keep this circumstance from happening to you. Another key point to consider is that the number one priority for trucking companies right now is to cut costs. While cost-cutting is always one of the top priorities for companies, it has become critically important in this current economic downturn. Freight rates have dropped because the amount of freight available has dropped, so carriers must cut back on costs to remain in business during times of decreasing revenues. One of the largest expenses for trucking companies is their payroll. By hiring students straight out of school instead of experienced drivers, the trucking companies are able to save a lot of money. So in this respect, the economic downturn is actually helping students find jobs! In speaking with several trucking companies that own their own CDL driving schools, most of them are hiring as many student drivers as they can get. A few of them had told me there was a temporary hiring freeze during December, but that was related more to their end-of-year financial numbers than it was to demand. A slowdown or freeze in hiring in December is common across many industries. But even in these tough economic times, most trucking companies were not slowing down their hiring of student truck drivers. The trucking industry is famous for its incredibly high turnover rate, which tends to average over 100% for many companies. Because of this, if a trucking company wants to downsize its fleet, all they have to do is slow down their hiring for a short time and the fleet size will shrink from turnover alone. So for most companies, especially the larger trucking companies, there is never a need to layoff drivers. So as you can see, even though times are tough in the economy and the media outlets love the word "layoffs" in their headlines, the trucking industry continues to bring in as many student drivers as ever to fill in the gaps caused by turnover and to keep the cost of labor down. So if you're considering a career in the trucking industry or are in the process of getting your CDL training, you likely have very little to be concerned about. Jobs are plentiful for new drivers in good times and in bad.